Maggie is a delight to work with both inside our shop, during community events and in our earn-a-bike workshops. 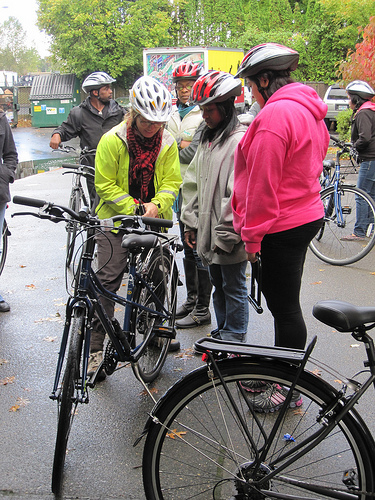 She is a smart, flexible, and fun volunteer, and certainly knows how to have a good time while teaching community members about their bikes. We’re so lucky to have Maggie’s support for the Create a Commuter programs and as a part of our organization. Check out what Maggie has to say about her time with us in the May Volunteer Spotlight. How long have you been volunteering with us? How did you start with the Community Cycling Center? I’ve been volunteering with the Community Cycling Center for over two years. I heard about the Community Cycling Center through friends and had visited the shop before checking the volunteer webpage. I love the mission of the Community Cycling Center. You promote biking for all! Bikes improve lives. I love what biking does for me and I hope others, given the opportunity to learn about bikes or to pursue an interest in bikes, will benefit from them like I do. What is your role as a volunteer? I mostly volunteer for the Create a Commuter program and have done a bit with the Holiday Bike Drive. They are both great programs that match people with bikes and build the bike skills of both the volunteers and participants. I learned how to overhaul a coaster bike hub through the Holiday Bike Drive Tuesday work nights! The Create a Commuter program is my favorite. People who need bikes for transportation get a bike and an introduction to all the great bike resources around Portland, and I get to meet them and talk commuting–which I love. Bicycle commuting saves money, saves time, improves your health, and is fun. It is such a great program providing bikes to people. My dream bike is the one I have now. I’ve had it for over 20 years (the frame that is–most everything else has been replaced at some time). It is like and old, reliable friend. I know how to fix it, I know how it handles, and it gives me a great sense of freedom and fun. I’m enjoying the NW and Portland by biking, walking, camping, skate skiing, and eating.